New officers elected to board of directors. The Waupaca/Waushara County Holstein Breeders, in coordination with the Wisconsin Holstein Association, hosted the annual Adult Holstein Convention at the Ale House in Waupaca Feb. 24-25. 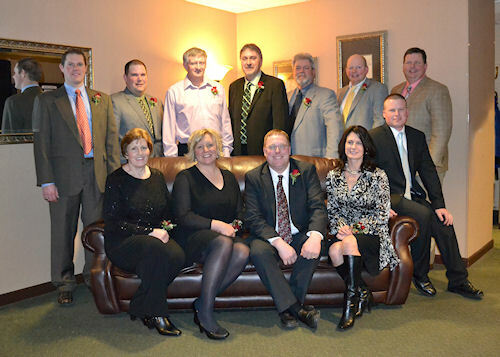 Some 200 Holstein breeders from across the state were in attendance for meetings and to receive recognition for outstanding accomplishments in 2011. Following the Holstein Association USA Region 5 meeting on Friday afternoon, breeders attended committee meetings to discuss new and old business for the upcoming year. At the dinner that evening, the 2011 Wisconsin Top Performer cows were announced. Recognized were Aaron and John Hass of Evansville, Mystic Valley Dairy of Sauk City, Hilrose Holsteins of Sherwood, Tom Kestell of Waldo, Beth Nelson of Blair, Elegance Futures of Lomira, Siemers Holstein Farms of Newton and Sunnyside Dairy Farms of Valders. Receiving the overall Top Performer was Siemers Holstein Farms with Spruce-Edge Outside Tana, EX-94, with a record of 7-04 305days 48,047 pounds of milk, 1946 pounds of fat and 1,456 pounds of protein. Also recognized were owners of cows that have produced 300,000 and 400,000 pounds of lifetime milk. Friday evening concluded with the announcement of the Young Adult Educational Scholarship award winners and the third annual Wisconsin Convention Futures Sale, sponsored by Wisconsin Holstein's Young Adult Committee (YAC). Winners of this year's Educational Awards were Angie Ulness of Valders, Sandra Madland of Lyndon Station and Dan Dvorachek of Reedsville. The Futures sale averaged $6,306 on 33 lots that included choices from some of the area's most prominent cow families. High seller at $27,000 was Lot #1, consigned by Matthew Johnson of Baldwin and purchased by Harry Broekhuis of Holland. This choice from Larcrest Constance-ET includes a pick from an 8/11 Snowman at +2355 GTPI; a 7/11 AltaIota at +2318 GTPI; or a 10/11 O-Style at +2304 GTPI. Second high seller was Lot #7 from Floyd and Lloyd Baumann & Fred Lang of Marathon at $19,000. This pick was purchased by Laverne Lepak of Custer, and includes a pick of two extremely contractable maternal sisters to last year's top selling choice from Ralma Baxter Cherrio-ET. Rounding out the top three was Lot #2 at $15,500, which was a choice consigned by Todd Stanek of Fall Creek and purchased by David Atwell of Mt. Horeb. Saturday morning kicked off with Keynote Speaker Carl Kent, International Sales Coordinator at Holstein Association USA, on "International Markets for Holsteins." Following Carl, the annual WHA business meeting was held, and included committee reports from board members who head the various WHA committees and a report on the financial status of the Association. Two new board members were welcomed to the WHA Board of Directors: Kevin Jorgensen of Waupun and Bill Calvert of Cuba City. Todd Stanek of Fall Creek and Matt Lippert of Pittsville were re-elected to another term. Following the annual meeting, 40-year, 50-year and 60-year members and Wall of Fame inductees were honored. This year's Wall of Fame inductees were W.D. Hoard, the cow Jan-Com Fond Matt Matilda, and the bull Lockway Soverign Lucifer Lad. The afternoon was highlighted by farm tours to Sandy-Valley Holsteins, B-Long Holsteins and Royola Holsteins. Honored at the Saturday evening banquet was this year's Younger Distinguished Dairy Person, Distinguished Service, and Distinguished Breeder award winners. This year's Younger Dairy Person was Craig Carncross of Lodi. Honored with Distinguished Service recognition was Steve Holte of Westby. Receiving the prestigious Distinguished Breeder honor was Paul Buhr of Viroqua. The WHA Board of Directors met at the conclusion of the convention to elect officers for the upcoming year. Newly elected officers are President Todd Stanek of Fall Creek, Vice President Marci Walker of Wisconsin Dells and Secretary Paula Bovre of Fond du Lac, with Matt Lippert of Pittsville and Chris McCullough of Juda also serving as Executive Committee members. The Wisconsin Holstein Association holds its annual convention each year in February. For more information on this or other events, check out the website at www.wisholsteins.com, or call 1-800-223-4269. Images of the award winners are available on our website or upon request.